Great little mod, but I rarely go into 3rd person mode. Works great otherwise. 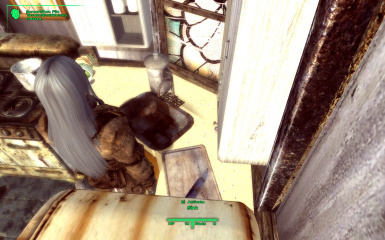 I guess this is why the fallout 3 idle revision mod doesn't display unless you're in 3rd person as well. Limitations of the engine I'm guessing. Meh... what are you gonna' do? Perfect mod for an immersive playthrough! Thank you! 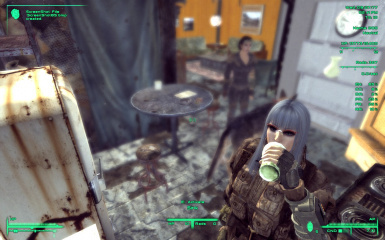 Well, this sure is a better way of drinking. I always found it a bit off that I would cup my blood stained, radiation covered, sweaty dirty hands to drink water instead of using one of the many empty bottles laying around. Well I mean it's a videogame and it doesn't really happen but... still I like this a lot more, nice job. The only thing changed is the animation, which will run no matter where you drink. Nice idea! Question, though. If you are not carrying a glass, you would just drink like in vanilla, correct? Thanks you guys for the kind remarks. I'm just glad to share with my friends. Celticgirl, you've did it again. Awesome mod and i do appreciate your work.Gladly endorsed. Yes, she just keeps coming out with these awesome mods. I just keep adding more to my game... and more and more. Excellent! I tried the mod in game and works perfectly! Thank you! 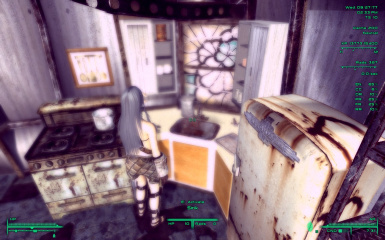 (Note: I drink water from sink and pool, even with this mod you will drink with glass from other water sources!